In March 1901 Henri Le Sidaner discovered the historic fortress town of Gerberoy, situated sixty-five miles northwest of Paris. His son Rémy recalled that Le Sidaner ‘longed to plan a garden of his own, in which the landscape would be designed by him personally and in which he could achieve his favourite light effects. He mentioned this project to Auguste Rodin, who recommended the Beauvais area. A potter living in Beauvais, answering to the name of Delaherche, recommended the village of Gerberoy.’ He initially rented, then purchased three years later, a small cottage in the centre of the town in order to escape from the pressures of Parisian life. During the following years he undertook extensive renovation and development of the property, taking a personal interest in every aspect of the design of the buildings and the gardens. The artist’s garden designs blended with the cottage and its surrounding buildings, softening the architecture with climbing plants and creating delicious areas of sunlight and shadow and spaces arranged like ‘garden rooms’ with plants of a single hue. Under the foliage-covered arch, the rustic table in dappled shade combines two of Le Sidaner’s favourite motifs, a still life and his beloved home. Situated on the shaded terrace of the main house, the table is simply adorned with a white table cloth; wine, fruit and a teapot await an unknown guest. Le Sidaner’s subtle use of colour expertly conjures up the atmosphere of a late summer afternoon, its light beautifully filtered through the abundant trellis; bright flashes of green and yellow create a sun-dappled effect against the pastel walls of the house which pulsate with delicate pink and blue tones. Jacques Baschet commented of Le Sidaner: ‘He is a pointillist, but not the kind who decomposes tones and applies them unmixed, thereby letting our eyes reconstitute the colours on our retina. His palette is extremely varied and subtle. The oils bind and melt together in highly delicate harmonies. Nor is he the kind to enclose forms within a heavy brushstroke, as is the practice among the younger school of painters. With him, the contours seem to emerge from the interplay of light, and in this respect, he is similar to Claude Monet’. Henri Le Sidaner was born in Port Louis, Mauritius in 1862, the son of a shipbroker of Breton descent. At the age of ten his family moved to Dunkirk and in 1880, after the death of his father, to Paris. Le Sidaner entered the studio of Alexandre Cabanel at the Ecole des Beaux-Arts in 1884, but was more inspired by Manet than by his master’s dry academicism. In 1889 he moved to Etaples, where he met the painters Eugène Chigot and Henri Duhem, who were to remain lifelong friends. Le Sidaner made plein-air paintings of Breton peasants and fishermen in a subdued palette. In 1892 a grant allowed him to paint in Florence, Venice and Katwijk in Holland. In 1894 he settled in Paris, transferring his allegiance from the Salon to the more avant-garde Société Nationale des Beaux-Arts. 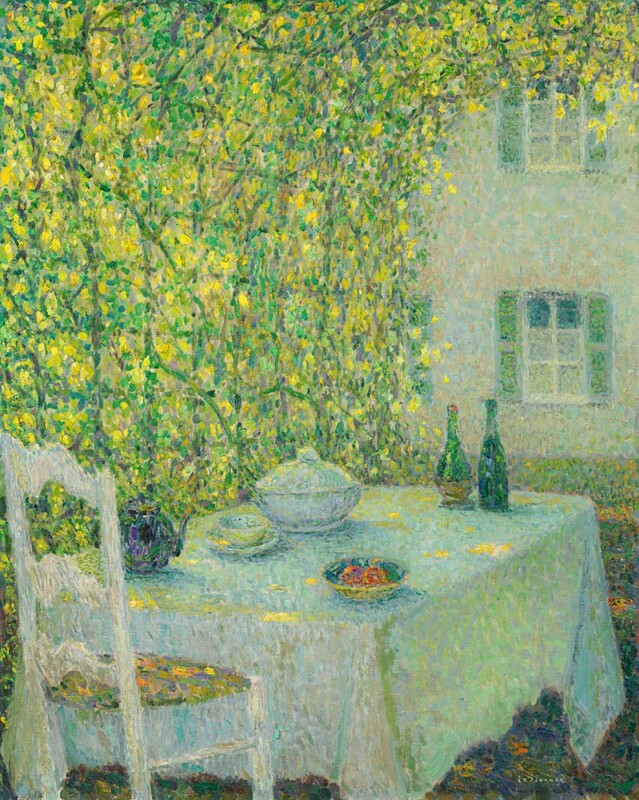 In this period Le Sidaner produced paintings such as the 1896 Morning (Musée de Dunkerque) and Twilight (private collection), which combine elements of Impressionist technique with Symbolist themes. That year he signed a contract with the Mancini Gallery. In 1898 Le Sidaner turned decisively towards the highly individual style, building on the innovations of Impressionism, that would characterise his work for the rest of his life. In 1898 he went to Bruges with his lover Camille; their son Louis was born in Paris in October, although the couple was based in Bruges for another year. In 1899 they returned to Paris and Le Sidaner became one of the group of artists represented by Galeries Georges Petit, which would give him financial stability and remain his dealer until 1930. Le Sidaner, keen to buy a country house around which he could develop a garden, was advised by Rodin to visit the terrain near Beauvais. In 1901 he rented a cottage in the picturesque town of Gerberoy (Seine et Oise). He bought it in 1904 and in 1910 greatly enlarged the house, creating a paradisiacal garden which provided the inspiration for many of his later paintings. Le Sidaner developed a poetic style of Post-Impressionism which explores the qualities of light and objects through harmonies and counterpoint of subtle tones. After 1900 he rarely included figures in his paintings, implying human presence through his interest in depicting a community of ancient houses, or a table set for tea. Le Sidaner’s works, with their evocation of mood and emotional engagement with landscape, have affinities with the music of ‘Impressionist’ composers such as Claude Debussy. Le Sidaner travelled in search of new motifs, wintering in Venice or London to escape the freezing cold of Gerberoy. From 1914 his family was based at a comfortable house in Versailles and summered in Gerberoy. From around 1920 his paintings employ a lighter palette and sparer, more dreamlike compositions. He was awarded the Légion d’Honneur in 1913 and the First Prize at the 1925 Pittsburgh International. Henri Le Sidaner died in Paris in 1939. Quoted in Farinaux-Le Sidaner 1989, op,. cit., p.14. Baschet, 1924, quoted in Farinaux-Le Sidaner, ibid., p.37.